When Sage Francis wants to go out on a limb, like he does with this "indie rock" record, he knows the right people to bring along with him. 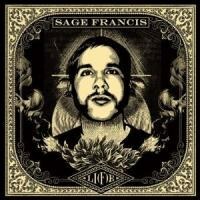 At one point on his new album, Li(f)e, Sage Francis insists, "I don't want you to like me." It's an interesting claim to look into, because Francis surely doesn't mind making us uncomfortable. Whether spinning verbose, brash freestyles, or populating his records with confrontational screeds and downright uncomfortable images, Francis follows his own twisted muse every step of the way. But he also delivers this all with a biting humor, cut only with a lot of heart, and that combination gives him an awful lot of charm, even at his most abrasive. Surely, there's some intention behind that, right? He doesn't want to totally put us off, even as he challenges us with every politically charged or emotionally revealing track. Li(f)e gives us both sides of Francis, the charming and the challenging, but here we get a new angle on his twisting hip-hop. On this record, Francis is backed by a band made up of members of Califone, and there are songs written with the likes of Grandaddy's Jason Lytle, Death Cab's Chris Walla, and the late Mark Linkous. So, to oversimplify it, this is Sage Francis' indie rock album, but really what this move does is give Francis a new foundation on which to build his moody songs. It's risky, in a way, but more because this music eschews the heavy-bass of programmed beats, so that there's nothing for Francis to hide behind. The music backs him up, but he's up front and bearing all. Which is just how he has always wanted it. The album is actually bookended by its two finest tracks. Both opener "Little Houdini" and closer "The Best of Times" showcase Francis at his best, weaving labyrinthine stories over long verses, working himself up into a frenzy the whole way through. Meanwhile, sonically the two songs give him something new to build those rhymes on. Jason Lytle's work on "Little Houdini" is excellent, spacious enough to let Francis' vocals steal the show, but providing a dusty, shuffling track -- one that at least partially belies Francis' claim that "this ain't no country-western song". It also introduces us to an album that truly is, as Francis intended, a band record. These aren't indie rock tropes -- whatever those are -- reshaped into hip-hop beats. Califone's Tim Rutili and Lytle and Walla and Linkous all do their own thing on this record, and leave Francis the challenge of keeping up lyrically. Nowhere does he do that better than on "The Best of Times". The track, a bed of gentle, atmospheric keys that tightens up into a lean driving groove, is the best music on the record, and Francis responds in kind with his finest lyrics. We get the revealing Francis here, reflecting on childhood pains. He's heartbroken and self-critical, but never slips too far into self-pity. Instead, as the closing track, it serves to show us where Sage Francis has come to. Where his strong voice comes from, what he's fought through and gotten past to get to where he is. It's a deeply affecting song from start to finish, and the perfect bracing sentiment to end the record with. That sentiment of self-actualization works well because much of the record deals in structures built to keep us from doing just that, chief among them is organized religion. The songs that populate the record run from lean power-pop, on "Three Sheets to the Wind", to the bluesy twang of "The Baby Stays" to the moody dissonance of "16 Years". And Francis holds his own, keeping his message steady over all these disparate sounds. It turns out his flow, which can shift gears at any moment, is suited well to these more rock-oriented compositions. He gets into trouble occasionally on the choruses, since none of them seem as hooky as choruses on his other records, and in some cases he seems to press on them a bit, shouting as if to drive home some kind of arena-rock feel. They don't ruin these numbers, by any means, but a number of choruses her become downtime between the far more interesting verses. Francis only really loses the thread here when he lets his images get carried away. Some lines -- like "When I came out my mamma, I was zero" -- are just a slight bit too goofy. But there's also lines about building a wall over a hymen, and about benchpressing babies naked, that don't do enough in the song to be worth the risk. "London Bridge" might be the only out and out misstep here, with the crunchy rocker feeling maybe too crowded for Francis to do anything with, so he resorts to easy references to tea parties, shifting tiredly to overt politics after a more intricate investigation of religion and faith. Of course, there's also surprising successes here, as the best stuff on Li(f)e also seem to be the most improbable. "Worry Not" shifts back and forth between a front-porch-sing-along chorus and some of Francis' quickest wordplay on the record, and the juxtaposition is both jarring and brilliant. It's moments like that on the record that make you realize the degree of difficulty in what Francis is trying to do. He didn't want a rock-influenced hip-hop record. He wanted a rock record he could rap over. It's no surprise, perhaps, that this works as often as it does -- considering how well he worked with Will Oldham on "Sea Lion" a few years back. But maybe that's the thing: When Sage Francis wants to go out on a limb, he knows the right people to bring along with him. So like him or not, you've got to respect the man's vision.